From Beemster’s famous Polder in the Netherlands, comes a joyful holiday message to get all cheese lovers, young and old, in a merry mood for their award-winning line of cheeses. Using only the milk from the Beemster cooperative, and the time-honored techniques passed down from generation to generation, Beemster has been crafting their cheeses for over a century. Beemster’s renowned line of cheeses have been artistically repackaged for easy brand recognition and selection, each one with its own distinct flavor and story. Beemster Mild, Beemster Medium, Beemster Aged and Beemster Extra Aged are easily identifiable from one another, and readily announces the cheese’s differentiating textures, age and allergen considerations. The branding allows shoppers to select which cheese is ideal for their taste and budget. The inventive labeling process shows the Beemster Cow in a serene North Holland landscape, highlighted by a sky that appears more like a sunset that coordinates with the age of the cheese. 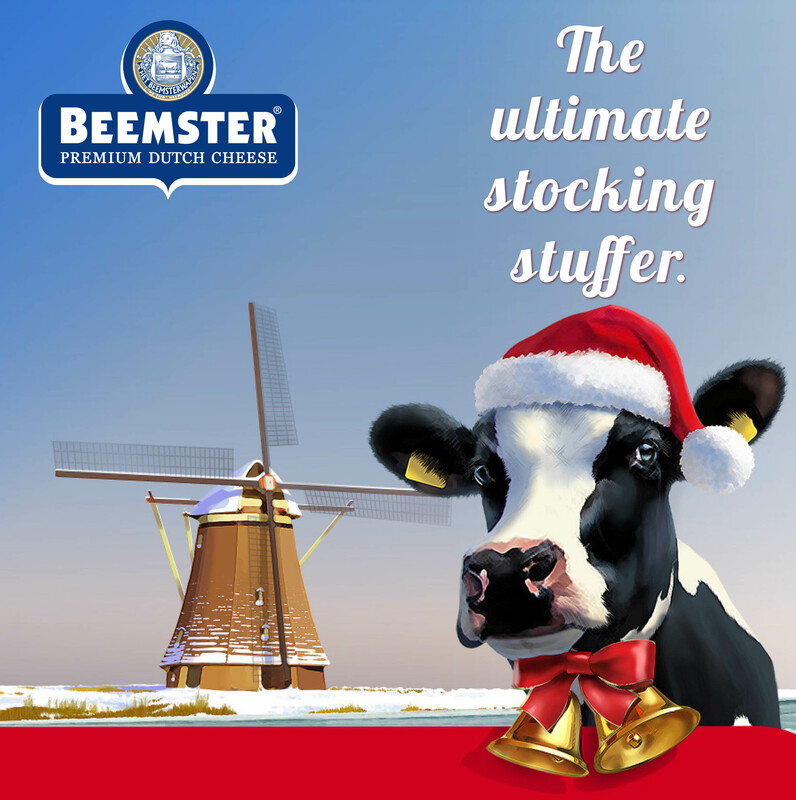 The beautifully painted Beemster Polder cow not only indicates the exceptional and uniquely rich milk used in Beemster’s holiday cheese selection, but accompanying seasonal stickers have her festively dressed in a Santa hat and red-bowed cow bells against a lovely wintery windmill scene, and a HAPPY HOLIDAYS wish. So cheerful and delicious, Beemster cheeses will warm the heart of anyone who experiences this delightful holiday selection. Application: Beemster cheeses are perfect for anything from informal snacking to fine entertaining. Cubed, sliced, shred or melted, their versatility goes as far as culinary imagination will take them. Beemster Mild’s soft, creaminess is excellent for cooking, while Beemster Medium’s semi-soft tang adding great flavor to cold and grilled sandwiches. Beemster Aged and its hallmark smooth, rich and bold flavor are a cheese tray must-have, with Beemster Extra Aged firm, robustness that is also delicious when grated over dishes. Pairing: The more mild Beemster cheeses go great with lighter, fruity red wines, like Grenache based blends and Gamay/Beaujolais. All go great with beers moving from lighter lagers to heavier stouts for the more mature Beemster cheeses. The most mature Beemster is a treat with an off-dry Riesling or Port wines. The award-winning Valley Produce Company’s passion for creating superior quality products has made them one of the most recognized and prominent gourmet food companies in all of Australia. VPC premium Plain Crackerthins are made with the finest, all-natural ingredients and always in small batches to ensure flavor and texture consistency and nutritional quality. 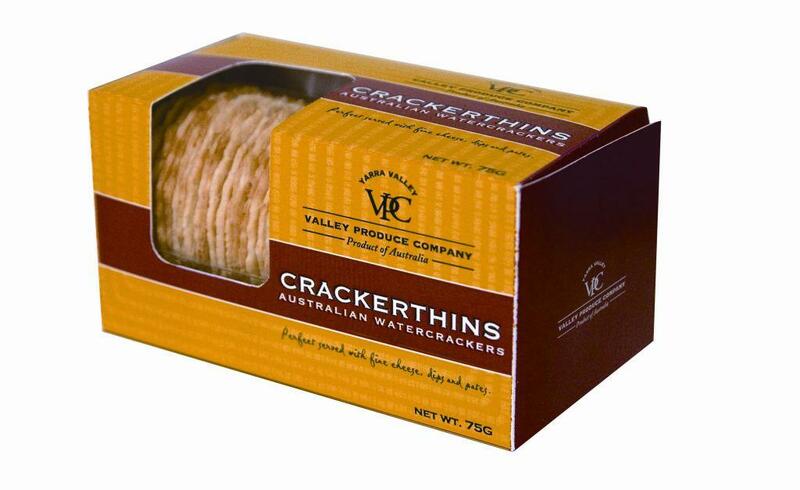 Packaged in two stay-fresh sleeves that maintain each Crackerthin’s perfect crispiness and crunch, VPC Plain Crackerthins, are ideal for a wide variety of uses including: fine cheeses, spreads, dips and antipasto.